It’s days like today that I wonder how I ever did it all when I worked full time. Holy cow things were busy! I had to bring my car in to get a nail taken out of one of my tires and a patch applied, I finished the laundry, cleaned the kitchen, took out all the trash in the house,got groceries, made a scrumptious dinner, and even worked for a couple hours. Whew! The scrumptious dinner was a recipe I made up. Meatloaf marinara, herb roasted red potatoes, and green beans. All this for 434 calories! Yes! 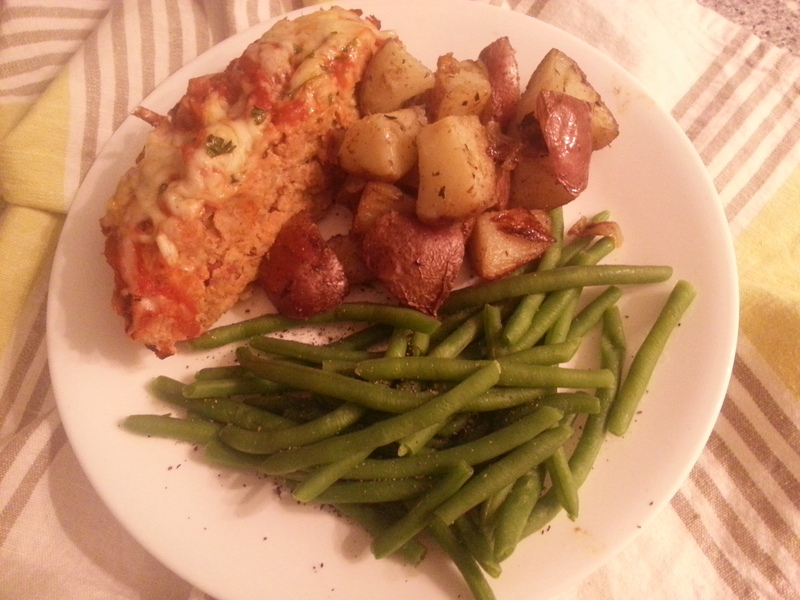 Meatloaf marinara, herb roasted red potatoes, green beans. This morning I had my typical cereal for breakfast and sandwich for lunch. For a snack, I had an Annie’s White Cheddar Single Serving Macaroni and Cheese cup. Even after all that, and subtracting 100 calories for overeating yesterday, I still had enough calories left over (with 4 to spare!) to eat the rest of my flurry from last night. I am full full right now. It’s so satisfying to lose weight at a slower pace. I’m eating more, working out regularly, and getting plenty of sleep. I highly recommend it! This morning, I got in a good workout at the gym. All week I had been planning on going to the gym today because it was supposed to rain all day. The rain had passed by the time I made it out of the car shop and I could’ve ran outside, but I decided the gym would be a good break from my normal neighborhood run. After a 1/4 mile walking warm up, I ran 2 miles on the treadmill. 3/4 of a mile at 7 mph, then next 1/4 mile at 8 mph. And repeat. It was faster than I would have challenged myself to outside and it was really hard, but I’m glad I did it! While I was at the gym, I wanted to do a few things that I couldn’t do at home. So after my run I spent 15 minutes on the stair machine. That’s about when I realized how out shape I had gotten in my month or so of slacking. I’ll get there! Next was weights, I did a few leg machines, really focusing on slow movements. A few minutes of abs and my workout was complete. All together, I burned 440 calories (net) in my hour at the gym today. I’m glad I moved my workout indoors today. It was a nice change in routine! Anyone else move their workout indoors today? How’d it go?